How do I add pay rates for employees? Firstly, click on the "Staff" tab. Next, find the employee for whom you wish to add or edit pay rate information and click on their name. 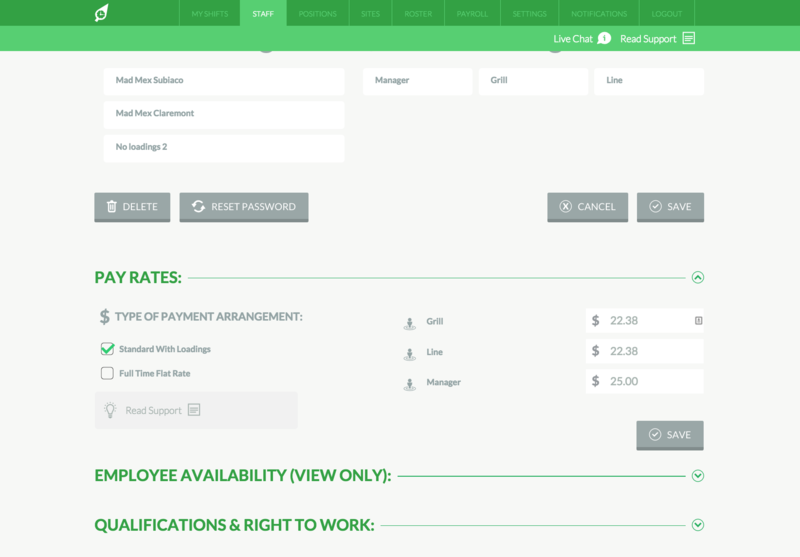 In the employee file, scroll down to the "Pay Rates" section and click on it. 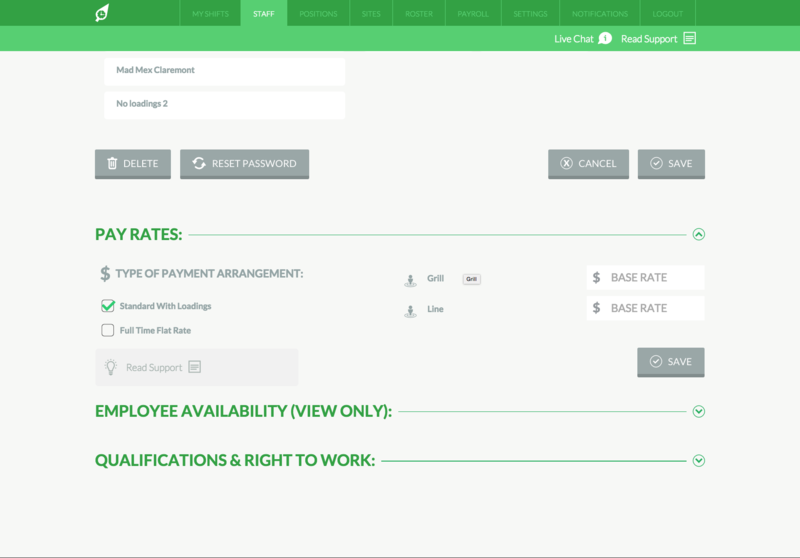 Here is the place where you can add and edit pay rate information for each employee on your account. Both these options are explained below. The "Standard With Loadings" option will be the option by default. Use this option if the employee has a base rate but you pay loadings if they work certain times and days. Eg They are paid $25 per hour but are given a 10% loading for working after 9pm, 20% loading for Saturday, 30% for Sunday and 50% for public holidays. 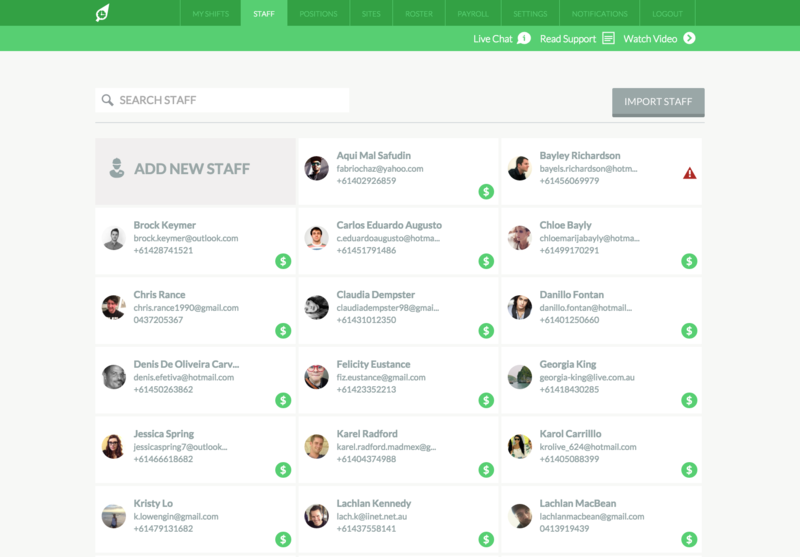 You will be able to add a base rate in for each position they work in the business. In the example below, this employee earns a base rate of $22.38 per hour when they work "Line" and "Grill" positions but a higher rate of $25.00 when they are rostered on as a manger. The second option is "Flat Rate" and this should be used for employees that are paid a flat rate for working REGARDLESS of the position they work or the times. This option is normally used for full time management employees who are on a fixed hourly rate. 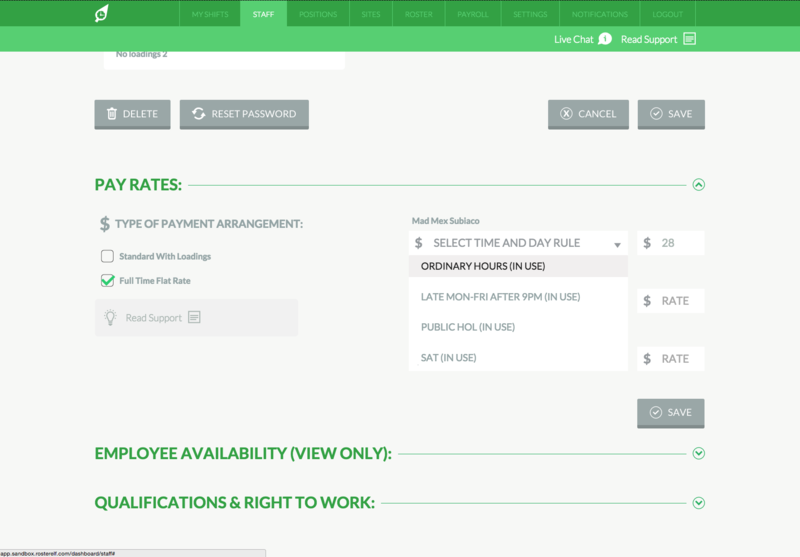 To use this option, for each site the employee is assigned to work, simply select the "Time and Day Rule" that you want to allocate 100% of their hours to and then type their flat payrate in the field. In the example below, this employee is on a flat rate of $28 and all hours will be assigned to the "Ordinary Hours" rule. PLEASE NOTE: Until you setup your payroll account with "Time and Day" based rules, you will not be able to select set employees up with this "Standard With Loadings" option.